Our ingredient baskets are a cornucopia of Thai pungency and pleasure. There are scarlet chillies, green eggplants the size of fat marbles, limes and sticks of lemongrass that, for now, conceal their aromatic beauty. The garlic is small and delicate, skin tinted with purple and brittle as parchment. It releases a tender aroma as we crush it with our knife blades. I've joined a cooking class at Banyan Tree Phuket Resort, not an activity I'd normally volunteer for while on holiday. My meal the evening before at Saffron Restaurant convinced me otherwise. 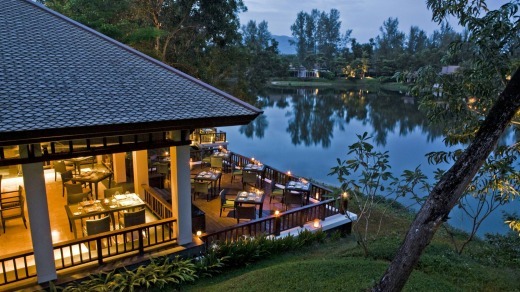 Saffron here was the first of the signature Thai restaurants that are now a feature of all Banyan Tree resorts, and it alone is good reason to stay at this luxury all-villa retreat. At dinner each course is, against the odds, better than the last. A delicate roll of fried snapper and rice noodles is outdone by quail egg and squid salad, then by braised-beef short ribs with longan, pickled vegetable and chilli-lime sauce. The slow-cooked lamb in creamy curry with coconut milk and peanut is sensational. 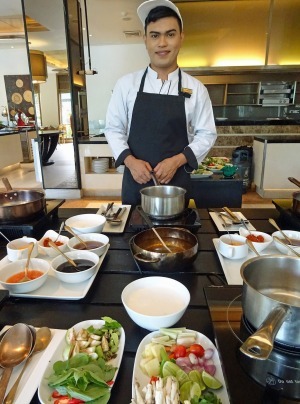 When I hear the resort runs a cooking class, joining is a no-brainer. Who wouldn't want to bring just a touch of this food home to their own kitchen? And so I find myself under the command of Chef Tonkaw, who has worked at Saffron for six years, and trained at the legendary Benjarong Restaurant at the Dusit Thani in Bangkok. We chip and dice and line up our ingredients like professionals, acquiring useful tips as we go. The chillies shouldn't just be sliced but crushed to release their oil. The mini-eggplants should be leaned upon to split them open, otherwise they won't cook. We're shown knife skills too, not with much success. Chef Tonkaw chops as quietly as a ninja, but we pupils bang on our chopping boards as if determined to splinter them. We have three dishes on our morning's agenda. 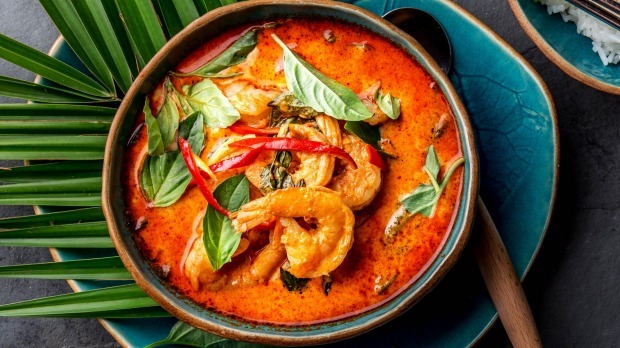 The first is kaeng phed goong, a coconut-based red curry with prawns. The chef explains how to adjust the balance of fish sauce and palm sugar, but this is otherwise a dish simple enough to give us confidence. Our second dish has many more ingredients. 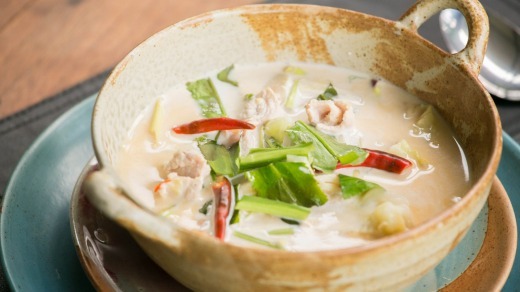 Tom kha gai, or chicken in galangal-coconut broth, is pungent with lemongrass, turmeric, kaffir lime leaves and coriander, and is seasoned with fish sauce and lime juice. The broth is a bright mustard yellow. I arrange a chunk of lemongrass and some mushrooms on top like a master chef, and dot the surface with attractive red explosions of chilli oil. "Put some more chilli in!" encourages Chef Tonkaw. "If Thai food isn't spicy, it isn't delicious!" Our final dish is pla raad prik, or deep-fried fish smothered in a sweet chilli sauce that's nothing like the gloop that comes from a bottle back home. We make it ourselves with finely diced pineapple, onion and chilli, which is added to a concoction of fish, oyster and soy sauces and dissolved palm sugar. The result is superb. We eat our lunch in meditative silence, proud and happy. Beyond the restaurant terrace, the Banyan Tree's lagoon is fringed with coconut trees and reeds and a pointillist's scattering of waterlilies. I can't bring the resort's myriad pleasures home, but at least I'll have a taste of its restaurants. I tuck Chef Tonkaw's booklet of recipes – fried noodles with prawns, hot-and-sour tom yum soup, green curry with chicken – into my suitcase. It promises Thai pungency and pleasure coming soon to my kitchen. 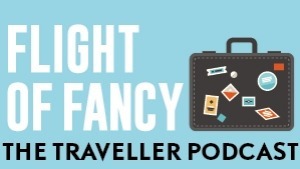 Brian Johnston travelled as a guest of Banyan Tree Phuket Resort and Peregrine Adventures.